May 19, 2016 – Upon re-entry from a deep space mission, NASA’s next generation spacecraft, more commonly known as Orion, will descend under its three main parachutes, swaying in the wind until its final splashdown in the Pacific Ocean. In that brief instant where capsule meets water, astronauts will experience the mission’s greatest deceleration and with that, some of the greatest forces on the human body. That’s where crash-test dummies come into the picture. 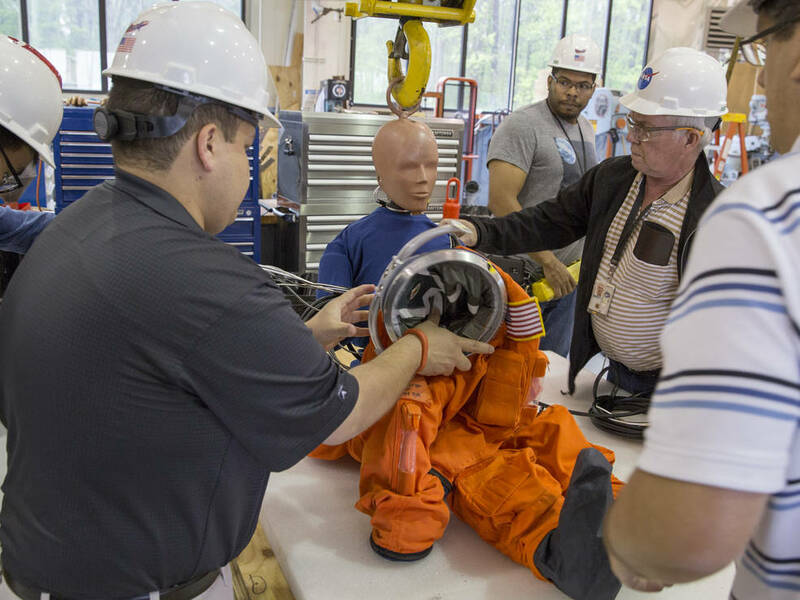 Engineers at NASA’s Langley Research Center in Hampton, Virginia, are working to ensure astronauts are uninjured during splashdown by performing water-impact tests of an Orion test capsule with suited crash test dummies inside. “Not only can we learn how the structure reacts to a water impact in these tests, but we can also understand how splashdown loads are transmitted to the seats and crew,” said Mark Baldwin, crew injury lead for Orion prime contractor, Lockheed Martin. During the most recent drop test, two crash-test dummies wearing modified Advanced Crew Escape System suits were secured in the full-scale capsule. Each dummy was equipped with internal sensors to help engineers quantify the potential for injury. “This gives us a better understanding of localized responses at the head and neck to protect against common impact injuries like concussion and spinal fracture,” Baldwin said. This test series was designed to take the Orion spacecraft through some of the most stringent scenarios possible while landing with parachutes. Drop tests account for the variety of wind and wave conditions that might exist when returning humans from deep-space missions. “We are intentionally going to extremes in this test series because that is where we need to demonstrate we can keep the structure intact and the crew safe regardless of the conditions at splashdown,” Baldwin added. With four vertical drop tests successfully completed, engineers now prepare for what’s ahead. Throughout the next few months, more rigorous testing will occur during five swing tests of the capsule with the fully suited dummies. Data from each test will help NASA prepare for Orion’s first flight atop the powerful Space Launch System rocket, and ultimately provide a safe return from NASA’s journey to Mars. Check out more images of the test dummies and drop tests.